BECOME A PARTNER TODAY & GROW YOUR BUSINESS Offer the best payment gateway to your clients and earn incentives. Easy to integrate payment gateway with dedicated account manager to help you as and when required. Onboard your clients and help them receive payment in their bank account, quickly and effectively. Earn generous incentives every time a transaction is made on your client's website/app. Partner Dashboard helps you track your client's sale and your commissions in realtime. Your clients get the best & latest payment technology with industry's best success rates. 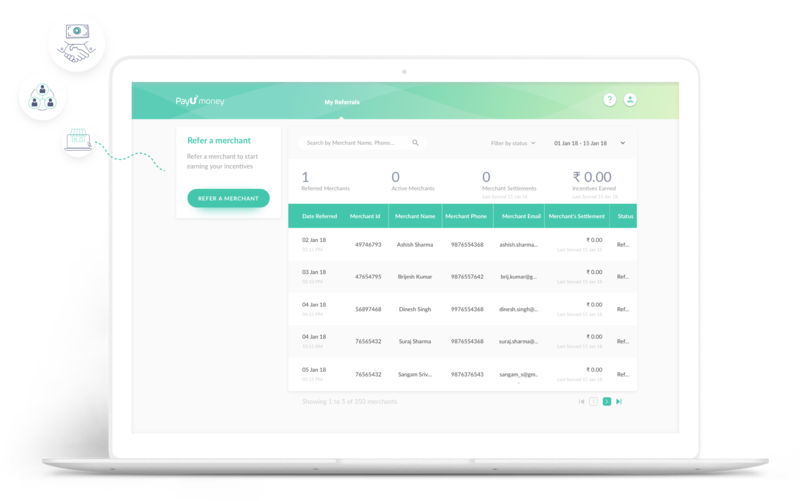 Completely online onboarding to help your clients receive payments within 5 minutes post signup. Your clients can keep track of all transactions, initiate refunds, get help and more at one single place. Practically anyone from a Web developer, Digital Marketing Agency, E-commerce Consultant, Blogger, Freelancer to a Student can partner with us. We offer payment gateway integration as service and highly recommend this partner programme. Great way to help my clients grow faster with the easiest onboarding process. One of the most rewarding partner programme out there. Ready to join the PayU Partners community? ?What documents will be required to register as a PayUmoney Partner? You will have to email the signed soft copies of the following documents to the email: reseller.admin@payu.in. ?I have a merchant account with PayUmoney. Can I use the same account to refer my clients? Unfortunately, that is not possible. You will have to create a separate Partner account with us.